How to paint clothing Victorian woman costume style. Learn from video tutorial and step by step images with instruction. 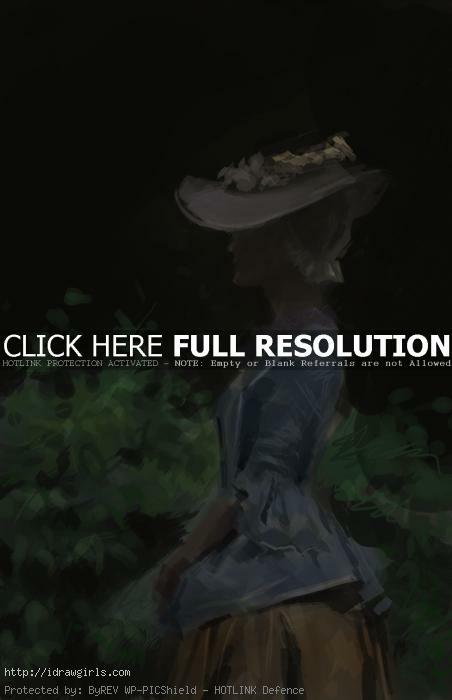 In this tutorial, you will learn how to paint clothing of women in Victorian period or style. You will learn how to paint basic cloth material, laces and big bell skirt along with the background environment such as garden and vegetations. Painting is mostly about light, shadow and correct color arrangement. This is a quick and short video tutorial study of material, light and shadow. A bit about women’s costume history in Europe. In the 1840s and 1850s, women’s gowns developed narrow and sloping shoulders, low and pointed waists, and bell-shaped skirts. Corsets, a knee-length chemise, and layers of flounced petticoats were worn under the gowns. By the 1850s the number of petticoats was reduced and the crinoline was worn. Day dresses had a solid bodice and evening gowns had a very low neckline and were worn off the shoulder and arm-length gloves. In the 1860s, the skirts became flatter at the front and projected out more behind the woman. Day dresses had wide pagoda sleeves and high necklines with lace or tatted collars. Evening dresses had low necklines and short sleeves, and were worn with short gloves or fingerless lace or crocheted mitts. Here is a quick painting of a lady Victorian costume. Below are step by step images painting Victorian clothing process. Step one, I just loosely draft out a female figure study in Victorian clothing from profile. Step two, I paint the biggest shape that I see first which is her top, then I dabble some green in the background. Step three, I fill in the rest of the image with color paint. Step four, now I paint some basic shadow and wrinkle on her hat, face, and dress. Step five, I paint more shadow and folding on her bell skirt. Step six, at this stage I can paint some lighter value or light and finish up the painting. Watch the video tutorial for more comprehensive instruction.